Gangling, earnest Mort is not a likely candidate for any of the professionals who show up to choose apprentices at the Discworld's version of a job fair. His father isn't surprised when his son is the last person remaining - but then Mort watches in astonishment as a living skeleton appears, riding an enormous horse (whose name, he later discovers, is Binky). It is Death, and Mort agrees (after ascertaining that being dead is not a requirement) to become his apprentice. Poets have tried to describe Ankh-Morpork. They have failed. Perhaps it's the sheer zestful vitality of the place, or maybe it's just that a city with a million inhabitants and no sewers is rather robust for poets, who prefer daffodils and no wonder. So let's just say that Ankh-Morpork is as full of life as an old cheese on a hot day, as loud as a curse in a cathedral, as colourful as a bruise and as full of activity, industry, bustle and sheer exuberant busyness as a dead dog on a termite mound. The characters are delightful. It is fun to watch Mort coming of age amidst all the chaotic events of the novel, and Death himself has a thing or two to learn along the way. There are surprising turns of events, appearances of characters from previous books in the series, and a sweet and funny romance. And there is substance beneath the humor, as the novel examines what it means to be human, how death influences the living, and how our beliefs shape our destinies. The books in this series are so clever and deftly written, with such memorable and compelling characters, that as I finish each one, I'm already planning to reread it some day. Just Add Books: "It’s a fast, funny ride through the Discworld, and the afterlife..."
Just One More Page: "I love any book where Death himself is a character, but I think that Terry Pratchett’s Death is coming to be my favourite (maybe he and the others I love can battle it out) and as such, this is my favourite Discworld novel to date." The Wertzone: "But it's the serious thinking about life and the place of people within it that makes Mort stand out a little bit more than some of the other early books." 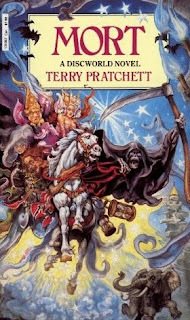 I haven't read any of the earlier Discworld books (I've only read the Tiffany Achings books). This one sounds like a good one to start with. Sharry - Thanks! It's a good one, isn't it?! RR2 - The Tiffany Achings are my favorites, but this is wonderful, too. It can be read without reading the earlier ones, but there is some payoff (insider jokes and insights, which are incidental but fun) if you start with the first one. Kiirstin - How did that happen? I have so many books out from the library that I think you'll find it easy to catch up. :-) I'll be looking forward to your thoughts on this one. This sounds very neat! Again, I have to say I really do need to pick these up! Ladytink - I'll do what you did to me with the Jaz Parks series. I'll just keep reading them and reviewing them until you give up and start reading them too. :-) You won't regret it!